AWARD WINNING CAMPAIGNS. PROVEN RESULTS. We design state-of-the-art campaigns that challenge perceptions about Out-of-Home advertising. Our custom-builds cover first-time executions, mobile interaction, AR & VR, smartAD® technology, and more. From digital executions to media firsts, PATTISON interactive campaigns bring people and brands together. Click on the examples below to watch videos of some of our innovative executions. Download the resources below for more in-depth knowledge on our product offering and services. Target consumers with our latest Digital Horizontal Poster in London. Download this Sell Sheet to learn about the benefits of digital advertising, and how it can achieve your advertising goals! 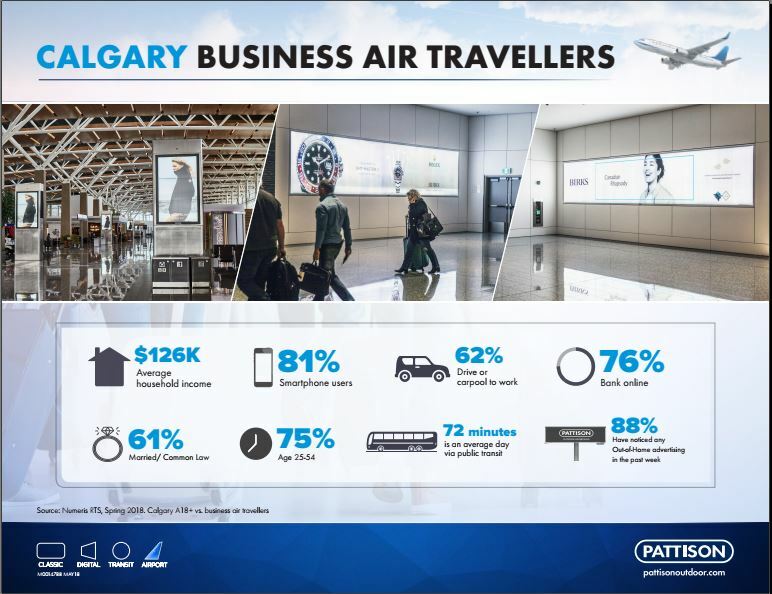 Is Your Audience Travelling through Calgary Airport? Target your audience with our Airport Fact Sheet. Download it to learn about who your audience is and where and how they are spending their time. Ottawa is an exciting place for advertisers to be! 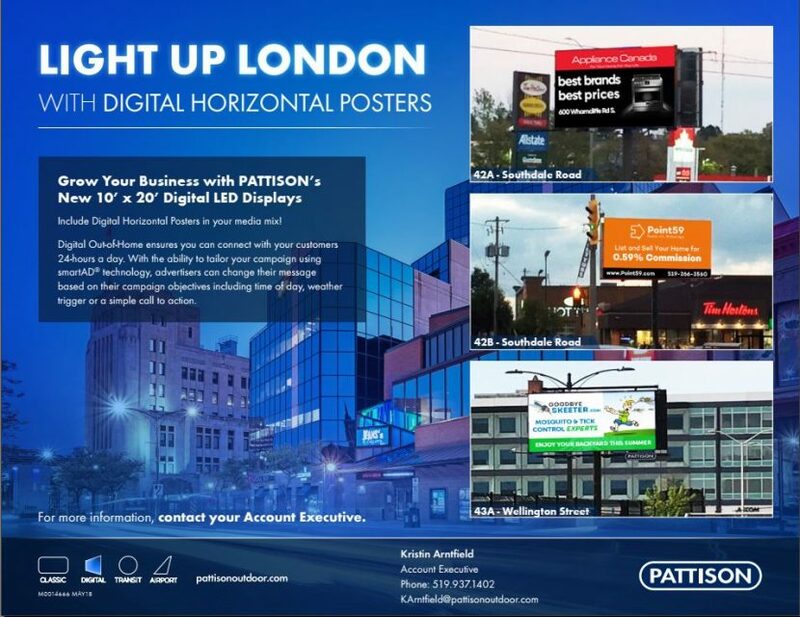 Find out how your business can leverage PATTISON’s Out-of-Home products to reach your audience! 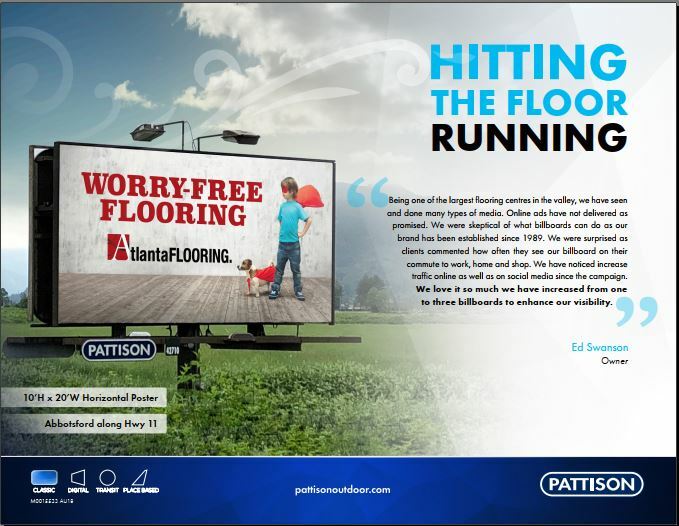 Find out how one of the largest Flooring Centres in British Columbia’s, Fraser Valley increased website traffic with their Out-of-Home campaign. Have a product or business to advertise in Kingston? 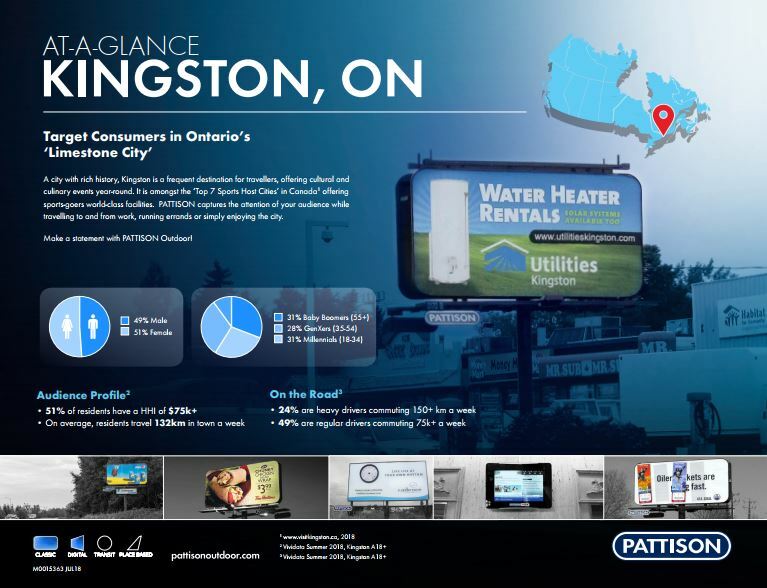 Download our Kingston At-a-Glance Market Profile to learn about the city, its’ residents and how to reach them with our products. Download to see a variety of PATTISON special Out-of-Home executions. We deliver outside-the-box solutions for all of our product categories. Explore our deck and ignite creativity in your next campaign! 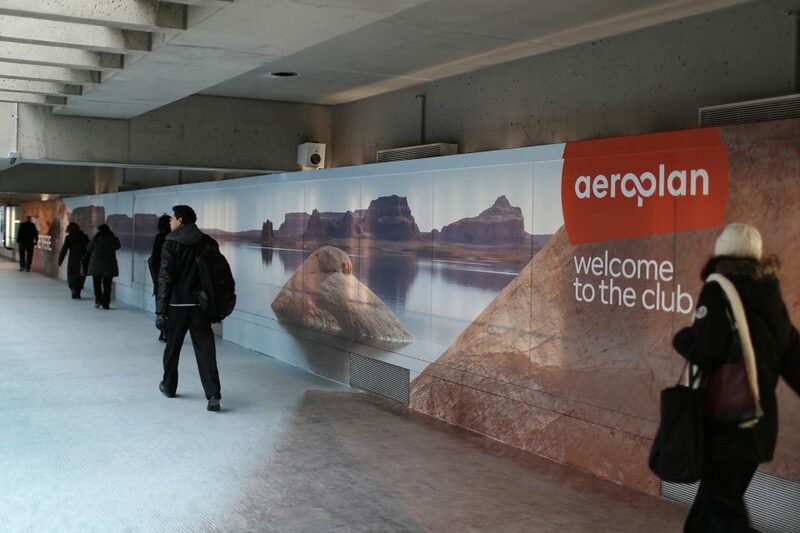 We offer advertising solutions in airports across Canada. See our wide variety of products in stunning Airport environments. Download our brochure for more details. TAKE YOUR MESSAGE TO THE NEXT LEVEL. Deliver your message in a novel way with poster extensions, lights and entirely custom units built exclusively for your message. Our Production experts transform your campaign into innovative and eye-catching displays that dazzle. 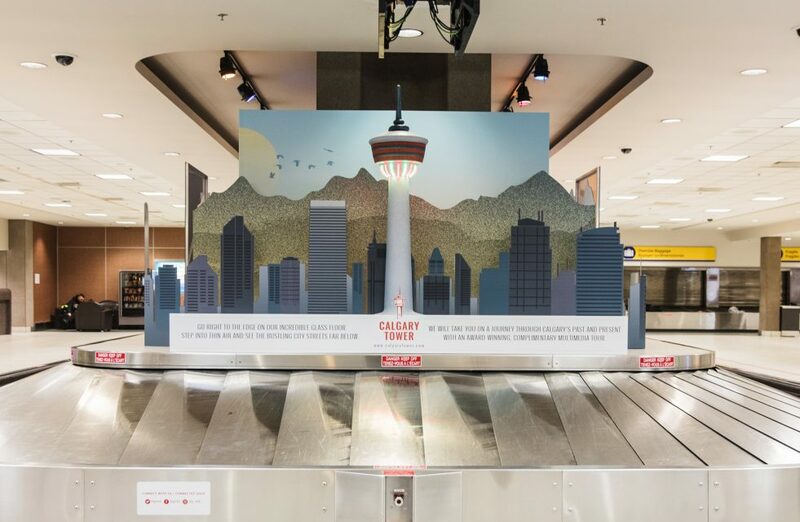 To excite travellers about exploring Calgary, PATTISON created a four-layer display out of aluminum and self-adhesive vinyl, which sat on top of a luggage carousel at Calgary International Airport. To complete the display, a 2D replica of the Calgary Tower made from carved foam was added with a row of colour-changing LED lights. The major fashion label had stylish fashionistas gawking when they styled the side of an articulated TTC streetcar with life-size die-cut vinyl extensions. Displayed on King Posters with Headliners and Extensions, French Connection’s Spring/Summer collection used the streets of downtown Toronto as their own runway. 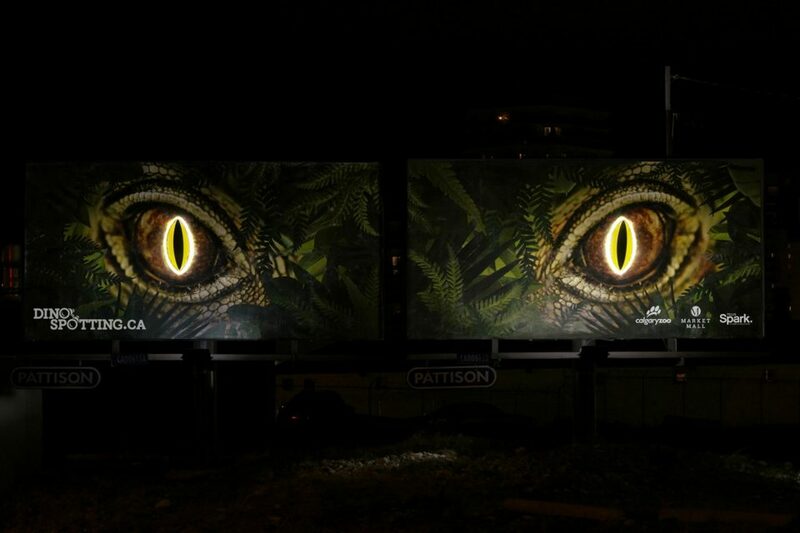 To promote the new Dino Spotting exhibit at the Calgary Zoo, we installed glowing LED dinosaur eyes on a duo of Horizontal Posters. Translucent styrene material was die cut in the shape of giant dinosaur eyes and mounted six inches off of the board. Self-adhesive vinyl pupils were pasted on top, with LED lights fixed behind, to give a glow effect at night. This menacing execution was sure to turn heads, especially once the sun set. 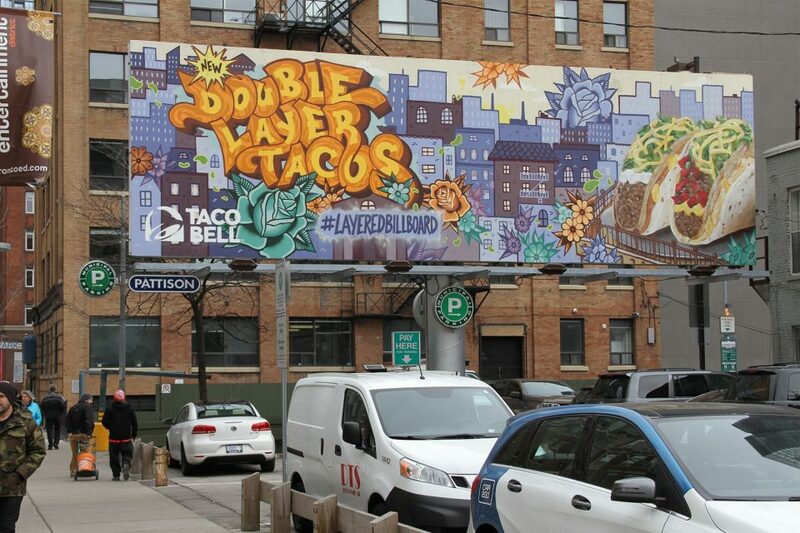 For the launch of the NEW Double Layer Taco, four Canadian artists were commissioned to spray paint the face of the board off-site, each layering their artwork to build this delicious, graffiti-style masterpiece sure to capture the attention of hungry eyes. 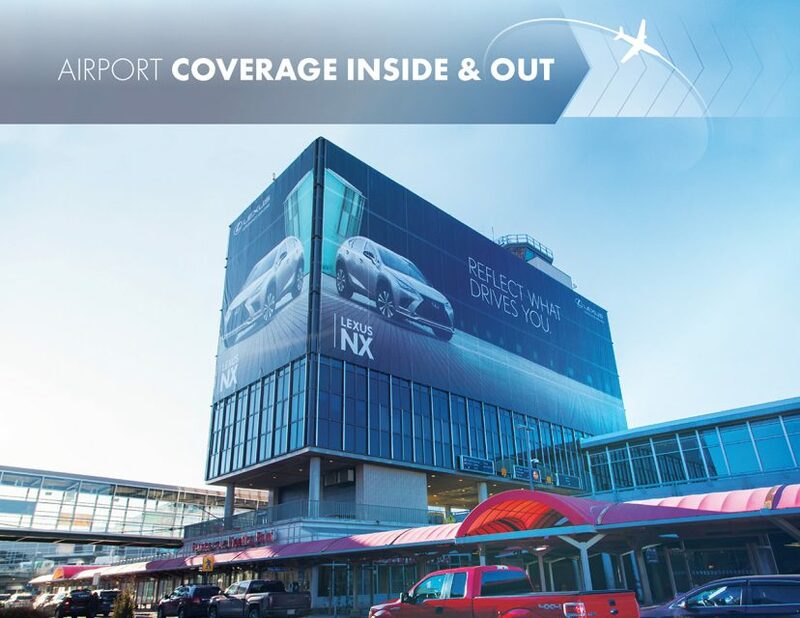 This impressive Tower Wrap at the Edmonton International Airport (sized at 45’ W x 62’ H and 144’ W x 62’ H) was printed on mesh vinyl so as not to obstruct the view from the interior and fastened to the building by cable attachments. 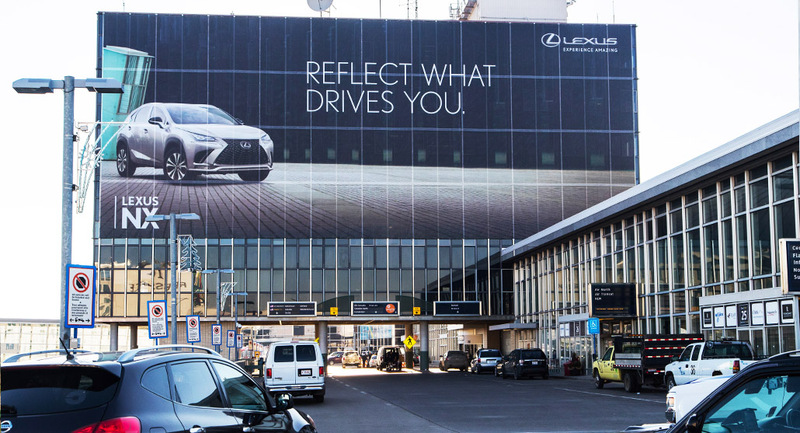 Impossible to miss, this buzz-worthy execution stood out from all angles, reaching Lexus’ key audience of business and leisure travellers. Areoplan, as Far as the Eye Can See. Aeroplan partnered with PATTISON to introduce Distinction, a members rewards program with the TD Aeroplan Visa Infinite Card. The result was a visually stunning series of murals and floor decals recreating the environment as an aspirational destination. This larger-than-life Mural was placed inside Toronto’s PATH, the largest underground shopping complex in the world. CARE Canada reached donors in a unique way in this Digital stunt aimed at driving awareness for their “She Too” initiative. 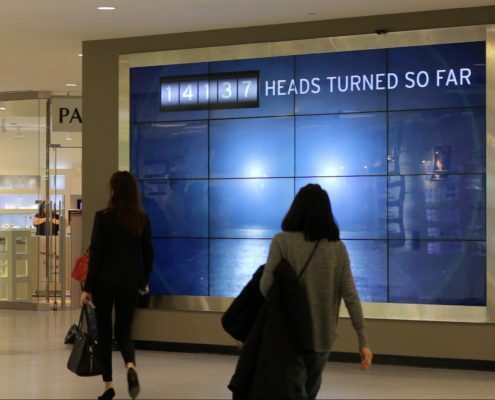 A “tap-to-donate” terminal installed beside one of our Video Matrix Screens found in the RBC Plaza of Toronto’s PATH, alongside compelling creative from CARE Canada inspired passersby to take action. 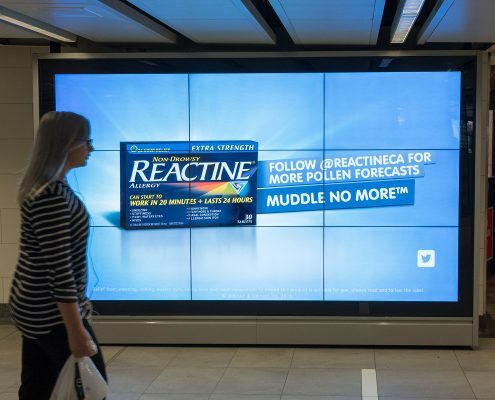 REACTINE® partnered with PATTISON to provide extra value to their target audience while promoting their Extra Strength allergy medication. 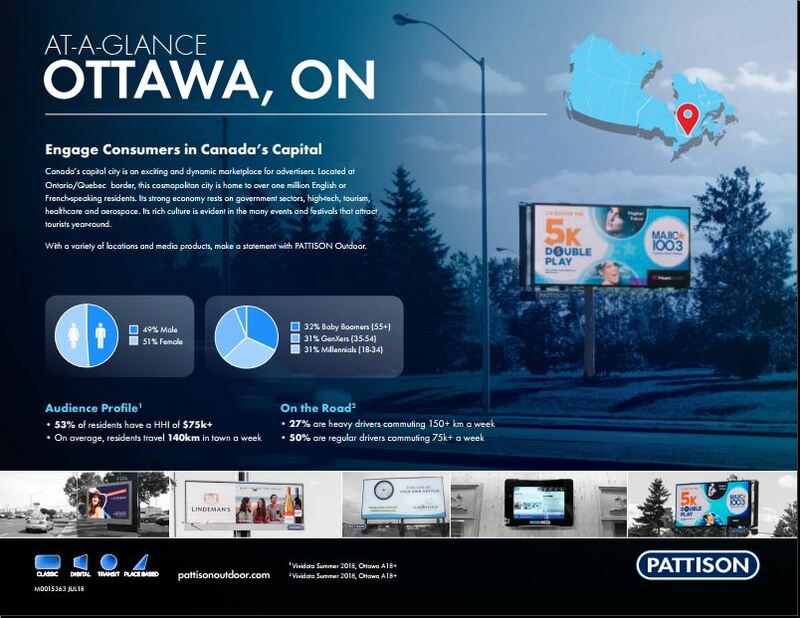 Taking a dynamic approach to advertising, their contextual campaign made use of PATTISON’s proprietary smartAD® technology. smartAD® enabled REACTINE® to update their messaging based on the daily Pollen Forecast, informing allergy sufferers in Toronto whether daily Pollen counts were ‘High’, ‘Medium’, or ‘Low’. 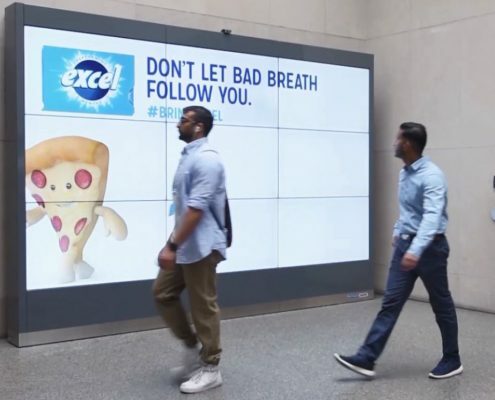 This campaign ran in Toronto on static digital and full-motion video products including Digital Superboards, Digital Videoboards, Digital Matrix Walls in Toronto’s PATH, and PATTISON Onestop’s Digital Office and Transit Networks. 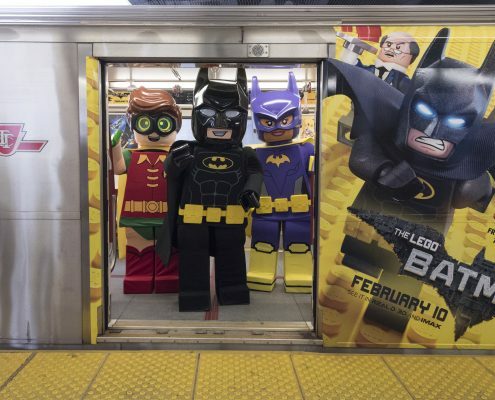 To announce the upcoming LEGO Batman Movie, PATTISON Outdoor collaborated with OMD Canada to create a lively Transit campaign that incorporated a variety of Transit Advertising elements, including a playful visit on board one of the subway cars from the life-size LEGO characters. TIDE dominated Toronto’s Union Station to promote their latest product, Tide PODS® Plus Downy®. 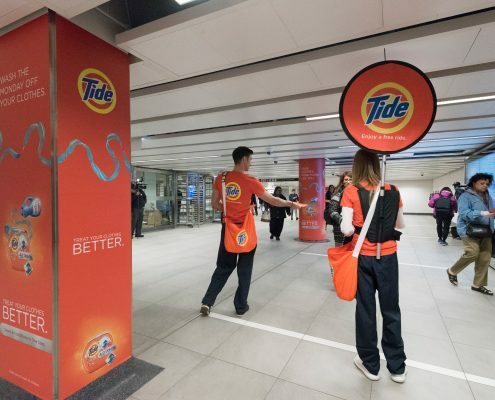 A dedicated TIDE team was on-site handing out over thousands of samples of the product along with complimentary TTC tokens to commuters riding the subway that day.